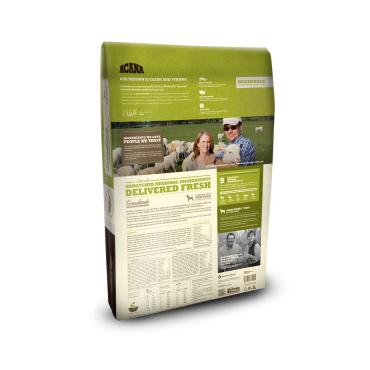 Brimming with goodness and taste, ACANA's meats are delivered to their kitchens FRESH or RAW daily, in WholePrey™ ratios to guarantee locked-in nutrients. 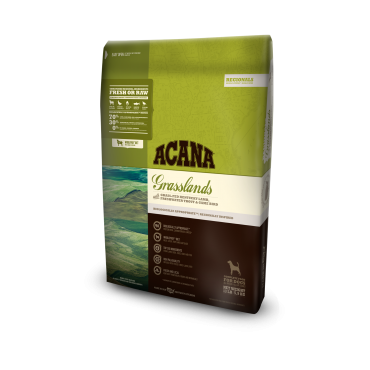 ACANA Grasslands rich inclusions of meat, fish and game mirror your dog’s evolutionary diet and promote peak health without the need for long lists of synthetic ingredients. Prepared in their Kentucky DogStar® kitchens from America’s best and freshest ingredients, ACANA Grassland is guaranteed to keep your dog healthy, happy and strong. Your dog is biologically adapted for a diet rich in meat. Equipped with sharp teeth, a single hinge jaw, and a short digestive tract, domestic dogs are anatomically designed to break down protein and fat from meat. That’s why ACANA loaded ACANA Grasslands with 70% meat, game, eggs and fish, including grass-fed Suffolk lamb, free-run Muscovy duck and quail, nest-laid eggs and freshwater trout, all sourced from regional farms and lakes. All our meats, poultry and fish are deemed fit for human consumption before arriving at our kitchen doors. Half of the meat ingredients in ACANA Grasslands are FRESH or RAW and delivered daily to their kitchens, so they are loaded with goodness and taste. Fresh means never frozen, so refrigeration is the only way we preserve our fresh meats, while our raw meats are flash-frozen at their peak to lock in natural goodness. The other ½ of meat ingredients are dried or oils to provide a strong, natural source of animal protein and fat. In nature, dogs benefit from an assortment of whole prey animals that provide all the essential amino acids, vitamins and minerals needed for peak health. ACANA Grasslands features a diversity of fresh meats in richly nourishing WholePrey™ ratios of meat, organs and cartilage to mimic your dog’s natural diet and provide essential nutriets. This eliminates the need for long lists of synthetic additives, so we only add zinc. 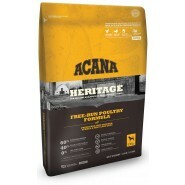 Entirely free of the pea or potato protein concentrates common in today’s dog foods, ACANA Grassland derives it rich protein content from premium animal ingredients (not plants). This supports lean muscle mass and a healthy body weight all while nourishing your dog according to his evolutionary needs. Your dog’s natural diet contains very few carbohydrates, which are recognized as a leading cause of obesity and diabetes. That’s why ACANA Grasslands limits carbohydrates and replaces fast carbohydrates (such as rice, potato and tapioca) with low-glycemic vegetables and fruits. This helps maintain healthy blood sugar levels, reduces the potential for fat storage, and promotes overall good health. Compare this to conventional dog foods which often exceed 50% carbohydrates, and feature high-glycemic ingredients such as potato, tapioca and rice – starches that digest quickly, causing blood glucose to spike and results in increased fat storage. Tess is a FAN Review by Our Picky Eater Loves This! HAPPY with Acana Grassland Review by Sylvia says YES to Acana Grasslands!